The sun was shining for local charities at Ardglass Golf Club last week as over 130 golfers drove off for the annual Down Business Connect Charity Golf Day, which took place last Friday, 7 September 2018. Now in its third year, the annual Down Business Connect golf day on Friday 7th September, helped raise approximately £5,000 for local charities, over the past two years. This year’s event welcomed 34 teams to the local business networking group’s charity golf day with an impressive £4,000 raised for two local charities, Mainstay DRP and the Northern Ireland Children to Lapland and Days to Remember Trust. Each of the charities will each receive 50% of the total amount, which was raised from a combination of golf fees, hole sponsorships, raffle tickets and member donations. 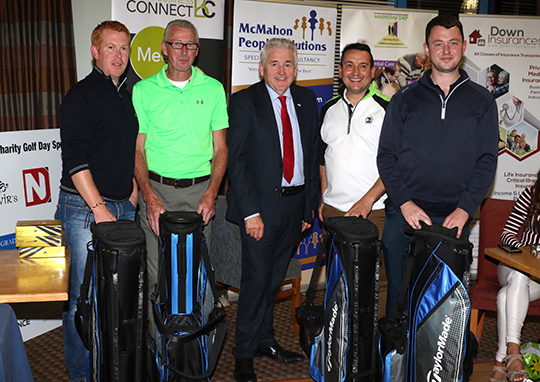 Brendan Kearney, chairman of Down Business Connect, presents the winning overall prizes to Paul Fitzsimons, Colin McKelvey, Michael Keenan, and Darren McKelvey after winning the third annual Down Business Connect charity golf competition at Ardglass Golf Club. The Team Scramble event was a huge success with the team of Paul Fitzsimons, Colin McKelvey, Michael Keenan and Darren McKelvey winning first place. Coming in at second was the team of Barry Fitzsimons, Kevin Truman, Jim McStravick and Stephen Holland from Downpatrick with Mark Cahir, Owen Curran, Ciaran Dorrian and Mark Armstrong from Ardglass taking third place. The team of Kevin Rogan, Richard McMullan, Eugene Jennings and Declan Toman, and G.J. McCann’s four ball took home fourth and fifth places respectively. Other prize winners at the event included Declan Toman, who won the Longest Drive prize. To view all photos, click Facebook link to Down Business Connect page (photos by Jim Masson). “On behalf of all the members of Down Business Connect, I would like to thank the golfers who took part and the local businesses who provided such great support for our Charity Golf Day. Many thanks must also go to Paul Vaughan and his team at Ardglass Golf Club for all their hard work in hosting such a successful day. Down Business Connect is a local business networking group, where business people in the Down area meet fortnightly to share ideas, make new contacts and helps to share business advice and expertise. The Group was established in 2015 and now has over 25 members from a variety of business sectors. Down Business Connect meets every fortnight at 7.30am at Denvir’s Hotel, Downpatrick. To find out more about Down Business Connect, follow the Group on Twitter via @DownBizConnect or @DownBusinessConnect on Facebook.